You can sail a boat without a rudder - how and why. Generally when sailing, you use a rudder to steer (well technically you use the tiller to control the rudder. However, it is possible to steer the boat without using the rudder, by several techniques. Why would you want to? There are several reasons - firstly, you can sometimes steer a course you would not otherwise be able to by using these techniques. Secondly, you may have lost the rudder. The first technique is called heeling, which basically involves tipping the boat to leeward or windward, depending on the direction you want to steer. This only gives the ability to steer a little, but that little may be all you need. This will only help you a little - if you need to make more drastic changes in course without a rudder (for example if you have lost it), then you alter the balance and sail settings accordingly. To start, raise the centreboard by one third, to reduce resistance but still have a point to pivot around. 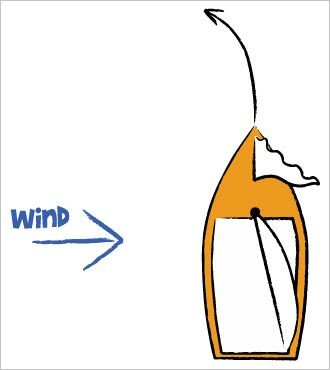 To luff up (turn closer to the wind), let the jib go, and use the mainsail only, as shown in the picture above. 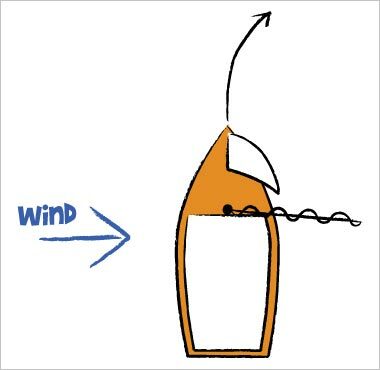 On a main and jib boat, because of the placement of the centre of effort (basically the mast location), the wind should blow the boat around its pivot point, into the wind. At the same time, heeling the boat to leeward (leaning towards the sail basically) will help to steer the boat into the wind. To steer away from the wind, let the mainsail go, and use the jib only. Again pivoting around the centreboard, the power in the jib will turn the boat. At the same time, heeling the boat to windward (leaning out on the side the wind is coming from) will help turn the boat. Through all of this, try to avoid oversteer, since without a rudder it's difficult to adjust overcorrections. Finally, unless you're just doing this to reach a buoy without having to tack, next time remember to tie the rudder on better!